St. Augustine Attorney James G. Whitehouse of St. Johns Law Group has once again been named to the list of Jacksonville’s Legal Elite by 904 Magazine. Of the 343 board certified attorney recognized by the magazine’s October-November issue, only 13, including Whitehouse, are board certified in the area of City, County and Local Government Law. More importantly, Mr. Whitehouse is the only such board certified attorney in private practice in St. Johns County. Specializing in litigation and land development representation of clients seeking land use, zoning, other permit approval, Mr. Whitehouse represents clients before many local government entities, including the St. Johns County Board of County Commissioners and the City of St. Augustine Commission. 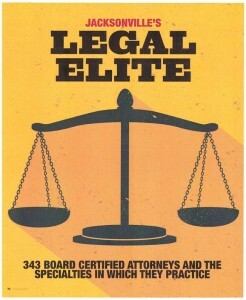 In its introduction to the listing, 904 Magazine explains “To practice law in the state of Florida, attorneys do not have to be board certified but certification is the highest level of evaluation by The Florida Bar of competency and experience within an area of law, professionalism and ethics in practice. Of the nearly 101,000 eligible Florida Bar members approximately 4,800 lawyers are board certified, a designation that places them among the only group of Florida lawyers who may use the terms ‘specialist,’ ‘expert’ or ‘Board Certified Specialist (B.C.S. )’ when referring to their legal credentials. To see the October-November issue of 904 Magazine, click here.